The Blues will look to turn things around when they host the Red Wings on Wednesday. ST. LOUIS — The St. Louis Blues’ downward spiral continued at Minnesota on Tuesday night. The Blues dropped their seventh straight in an 8-3 drubbing against the Wild. A team that had a firm grasp on a playoff spot a couple weeks ago is now on the outside looking in for a wild-card spot in the Western Conference. Even a roster shakeup didn’t change the team’s fortune as the Blues played for the first time without center Paul Stastny, who was traded to Winnipeg on Monday. The losing streak is the worst for the team since a 0-5-2 run from Dec. 26, 2009 to Jan. 7, 2010. “It’s embarrassing,” forward Vladimir Tarasenko told NHL.com after the game. The one highlight was Tarasenko’s 25th goal of the season, which broke a team scoreless streak of 150:23. The Blues will look to turn things around when they host the Detroit Red Wings on Wednesday at Scottrade Center. Forward Alexander Steen said the time for talk is over. 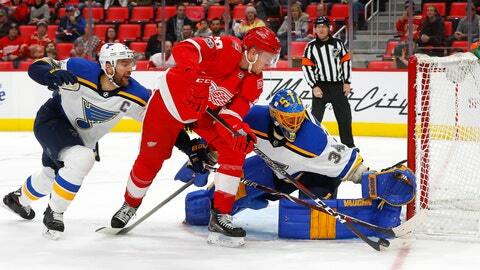 St. Louis won at Detroit 6-1 on Dec. 9 and has a seven-game points streak (3-0-4) against the Red Wings. The Blues will face a rested Red Wings squad that hasn’t played since beating the New York Rangers 3-2 on Sunday. Detroit comes in on a two-game winning streak. It will be the first game for the Red Wings since the club sent forward Tomas Tatar to Vegas for three draft picks. Forward Tyler Bertuzzi figures to get a spike in playing time with the trade.